In 1933 we formed an alliance with the British Army unit The Loyal Regiment (North Lancashire). As a result of organizational changes in the British Army, the alliance changed to The Queen’s Lancashire Regiment in 1970 and to The Duke of Lancaster’s Regiment (Kings, Lancashire and Border) in 2006. Our Regiment was first affiliated with the PPCLI on 19 October 1954 as The Loyal Edmonton Regiment (3rd Battalion, Princess Patricia’s Canadian Light Infantry). 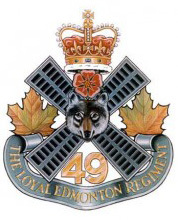 On 1 April 1970, with the addition of a 3rd regular force battalion to the PPCLI, we became The Loyal Edmonton Regiment (4th Battalion, Princess Patricia’s Canadian Light Infantry).